If you recall, back at the beginning of Autism Awareness Action month this year, I suggested that if you wanted to take Action, to really do something, that perhaps you should make a donation to TeamTMR, the new non profit arm of The Thinking Moms Revolution that gives grants to families strugging to treat their sick children. I told you that I was personally going to find a way to be a part of it. I reached out to their board, and volunteered. It was that simple. The next thing I knew, I was the coordinator for fundraising for Team TMR. This means I get to organize people - which is kind of what I do professionally. 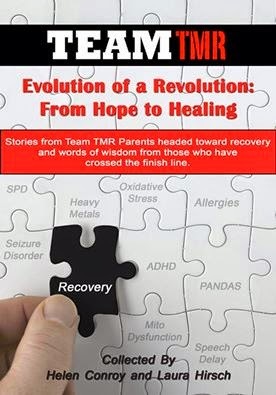 As part of that, I was invited to write a chapter in the new ebook, "Evolution of a Revolution: From Hope to Helaing". I wrote Dominic's story. They gave me a nickname and everything (I'm sure you can figure out which one is me, if you go look). Our book has released in E-Book form on Amazon today (its coming soon in Nook form). And we plan to have hard copies at the AutismOne Conference next weekend. All proceeds are going to go to TeamTMR's grant fund, so i would be very grateful if you would consider purchasing it. This grant fund - its what we never qualified for (either we made too much money or we had too few kids or we were already started treating... or we were this or that... whatever. We tried for a lot of grants, and none came in), and with the numbers of sick / injured children skyrcocketing ... well, the program is very needed. You can purchase a copy for your Kindle here. The Nook version is coming soon. Its hard to believe I went from volunteering to help a cool group to published author in roughly a month. *Wow*. And I should tell you - If you're interested in doing a fundraiser for TeamTMR - organizing a bake sale or a car wash or a 5K - Let me know! !